It's no surprise 76ers general manager Sam Hinkie was satisfied with the players and draft choice he received for veteran Thaddeus Young. Hinkle spoke Tuesday afternoon on a conference call about the trade that sent Young to the Minnesota Timberwolves for two players with expiring contracts, 6-foot-8 forward Luc Mbah a Moute and 6-6 guard Alexey Shved, along with a top-10-protected first-round pick of the Miami Heat. It was part of Friday's three-team trade, with Minnesota sending Kevin Love to the Cleveland Cavaliers and getting back this year's top pick, Andrew Wiggins; last year's No. 1 overall selection, Anthony Bennett; and the first-round pick of Miami that the Timberwolves then sent to the Sixers. Minnesota also received a trade exception. 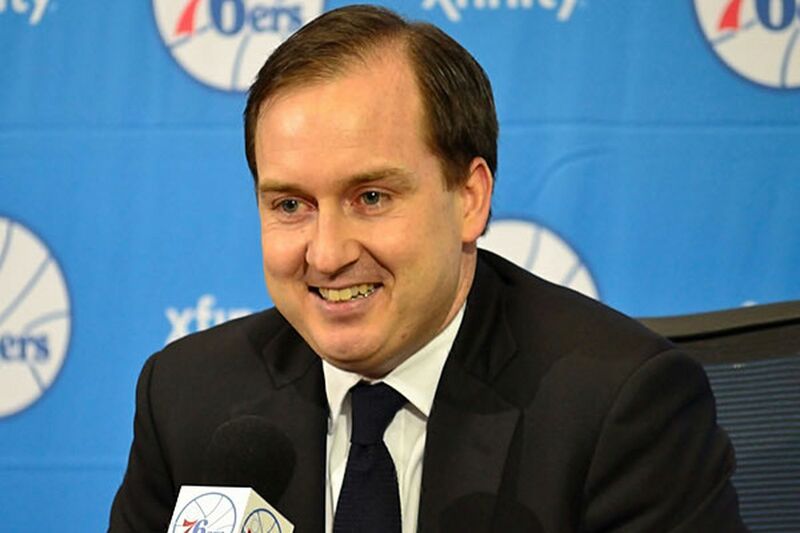 "I think in a trade like this, several components matter," Hinkie said. He seemed most enthusiastic about the first-round pick, and for good reason. Mbah a Moute, while known as a solid defensive player, and Shved offer little offensive production. Mbah a Moute averaged 3.5 points and 2.3 rebounds last season playing for Sacramento and then the Timberwolves. Shved averaged 4.0 points in 10.5 minutes during his second season with the Timberwolves. Mbah a Moute is slated to earn $4.82 million, while Shved's salary is nearly $3.2 million. For that the 76ers traded Young, a Sixer for seven seasons who averaged 17.9 points and six rebounds last season. Young is to earn $9.2 million this season and has a player option for $9.7 million next season. The Sixers were intent on getting something for Young before he had the chance to opt out. Hinkie lauded Young for the professionalism he brought to the franchise. "Thad Young has been here seven years for the Sixers and has laid it on the line night after night, undergoing a lot of change, some in the last year, and has continually brought it every day," Hinkie said. ". . . He was a day-to-day professional." Hinkie believes that Mbah a Moute, who turns 28 next month, could be a strong mentor to first-round pick Joel Embiid. Both are natives of Cameroon and have forged a strong relationship. "Luc's relationship with Joel can only help," Hinkie said. Earlier rumors had Bennett going to the Sixers in the trade. Hinkie said there was nothing to it. "I can tell you unequivocally we didn't have any conversations or discussions on Anthony Bennett," Hinkie said. Hinkie was just as adamant that rumors linking Philadelphia product and Cavaliers guard Dion Waiters to the Sixers were bogus. "Similarly, there haven't been any conversations there," Hinkie said. In other Sixers news, Hinkie said that rookie of the year Michael Carter-Williams, who underwent right-shoulder surgery May 6, was shooting and "working out hard" but had not been cleared for five-on-five contact. Hinkie said he was happy with the progress of center Nerlens Noel, who missed all of last season while recovering from anterior cruciate ligament surgery but played with the Sixers in the summer. It's too early to tell whether Embiid will play this season, Hinkie said. Embiid had surgery June 20 for a stress fracture in his right foot. As they were with Noel, the Sixers will likely be cautious with Embiid, who tweeted Tuesday that he signed his NBA contract, although the team had not released the information. Embiid was the No. 3 overall pick. The first-year slot value for the No. 3 pick is $3,689,700, according to RealGM.com. A first-round pick can sign for as much as 120 percent and as little as 80 percent of the rookie scale.